What can DNC visitors to Denver expect? August is usually one of nicer weather months as summer winds down and temperatures cool. The Democratic National Convention will be in Denver August 25th to August 28th and chances are the weather will be just fine. A look back at historical weather events on those days though shows some interesting things have occurred in Denver weather history. 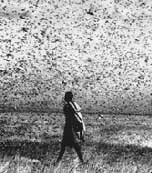 August 1875 saw grasshopper swarms in Denver. In 1910, the lowest temperatures every recorded in August – 40 degrees – was recorded on August 24, 25 and 26. In 1951 a microburst produced a 50 mph gust of wind at Stapleton International Airport. In 1964 thunderstorm winds gusted to 59 mph. 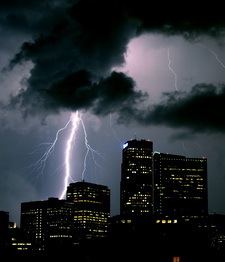 More recently, in 1994, lightning struck a power pole in Louisville causing a two hour power outage. The aforementioned grasshopper plague and low temperatures occurred on this date. In 1944 one of the most destructive hail storms in the city caused nearly one million dollars in damage as it struck between 2:00 and 3:00pm. Hail from very small to 1 ½ inches was reported and covered the ground to depths up to six inches in some areas. Downtown Denver recorded 0.95 inch of rain and heavy hail. News reports of the day report people being cut by broken glass, people being stranded by flooded cars, sewers backing up as they were unable to handle the deluge, buildings being flooded, trees stripped, telephone poles downed and more. The next day the American Red Cross was designated by the War Department to grant any and all priorities needed to repair the damage. In 1961 two workmen suffered a broken foot and bruises when severe winds blew in the walls of a warehouse under construction. On the 26th and 27th in 1980, two thunderstorms hit Arvada and Westminster dumping 1.5 inches of rain in an hour. Streets were washed out and homes and cars sustained damage. Three homes in Arvada sustained damage from lightning. The 1875 grasshopper invasion continued. Lightning is always a danger in Colorado. In 1967 a young woman that was horseback riding in west Denver was killed when she was struck by lightning; the horse died soon thereafter. Another woman and young man riding with her were injured when they were thrown from their horses. Lightning also did damage to houses in Arvada in 2003 and Parker in 2005. 1996 saw some excitement in the Fort Lupton area when 2 – 3 inches of rain fell in a 45 minute span. A local college suffered damage when its roof leaked. A weak F0 tornado was also reported in the area. Not so long ago in 2002 large hail struck the metro area on this date. Hail as large as 2 inches was reported in Jefferson County as well as 1.5 inches in Golden and Lakewood, 1 ¼ inches in Nederland, and 1 inch hail in Elizabeth, Louviers, Rollinsville and Blackhawk. 2004 saw a cold spell hit the Denver area. That year on the 27th the high temperature only reached 55 degrees setting a record low maximum for the date. The low temperature of 48 tied the record low as well. Yes, the grasshopper swarm in 1875 continued. The cold spell in 2004 yielded a low temperature on this date of 42 degrees setting a record. 1968, lightning again reared its ugly head. One man was seriously injured while riding a roller coaster at Denver Amusement Park. An airline employee was injured by lightning while working on a plane at Stapleton International Airport. Also, lightning caused serious damage to a Denver house and minor damage to several others. Also on this date…. In 2002 a thunderstorm produced ¾ inch hail in Parker and in 2005 lightning sparked a small fire near Jamestown. This entry was posted on Wednesday, August 13th, 2008 at 6:26am MDT and is filed under Colorado Weather, Local News, Thornton Weather, Weather History. You can follow any responses to this entry through the RSS 2.0 feed. You can skip to the end and leave a response. Pinging is currently not allowed.